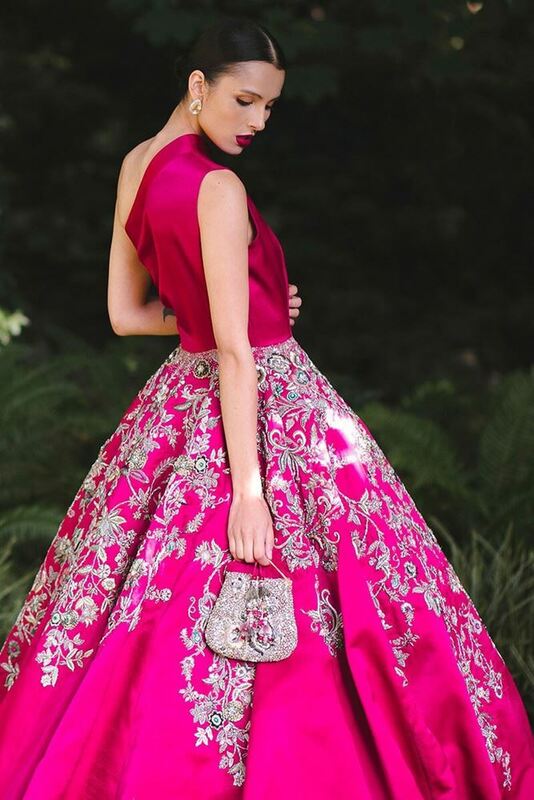 All of us can say that we love Shamsha Hashwani’s brilliant colors and designs. She actually makes it a point to use the color not as a canvas, but as a part of the actual design. 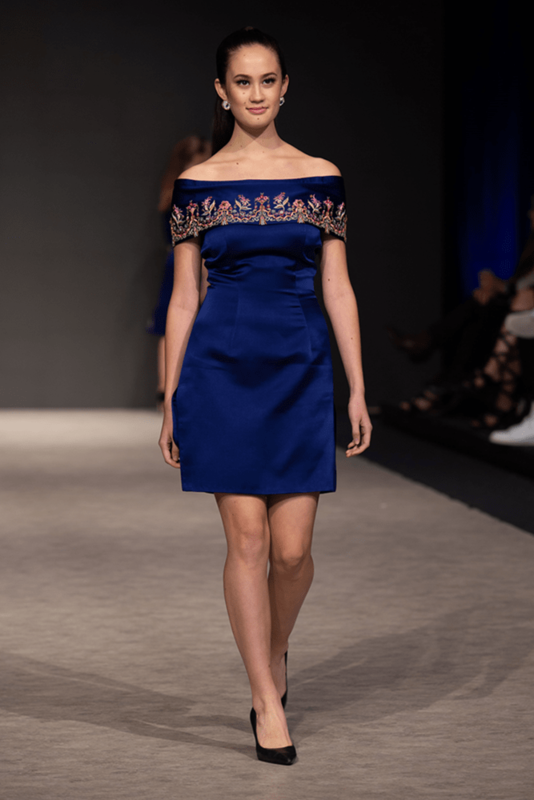 The renowned couture designer of Pakistan, Shamsha Hashwani showcased her latest collection of fusion couture at Vancouver Fashion Week Spring/Summer’19, and it couldn’t have been more perfect. Known for her amazing aesthetics, Shamsha Hashwani used a gem colored pallet. 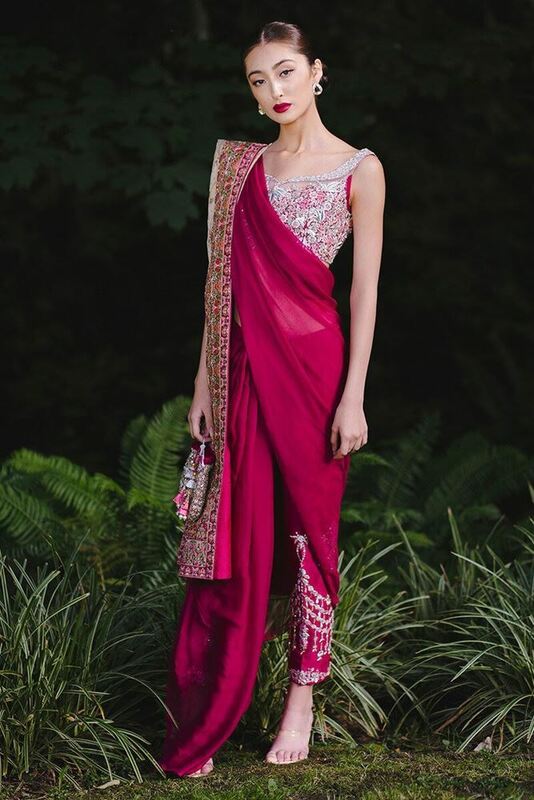 The 16-piece collection is crafted from the silk, chiffons, georgette and Jamawar. The silhouettes of the Shanaz collection are all modern contemporary, including jumpsuits, and evening gowns. 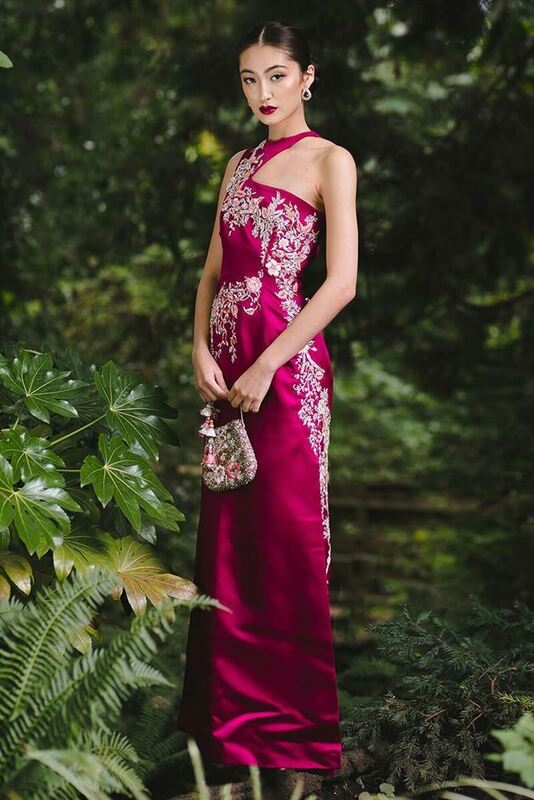 The hot pink, fuchsia and magenta pieces in Shanaz are glamorous and bold, perfect for evening engagements. We have sheath dresses, contemporary saree silhouette and evening gown, made to dazzle. We love how the silver of the work brings out the fuchsia base. It’s beautiful and mesmerizing. 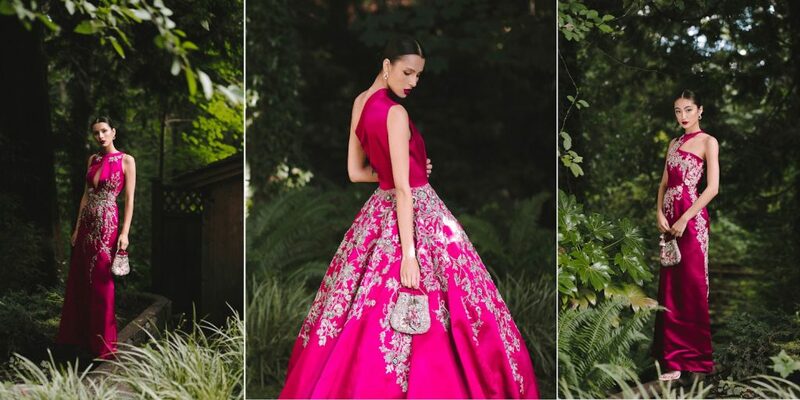 The ball gown is something you can choose for your wedding reception, if you are over the lehengas. Teal is a flattering color. It looks universally good on everyone so it’s no wonder at how effortlessly chic these teal blue outfits by Shamsha Hashwani turned out. 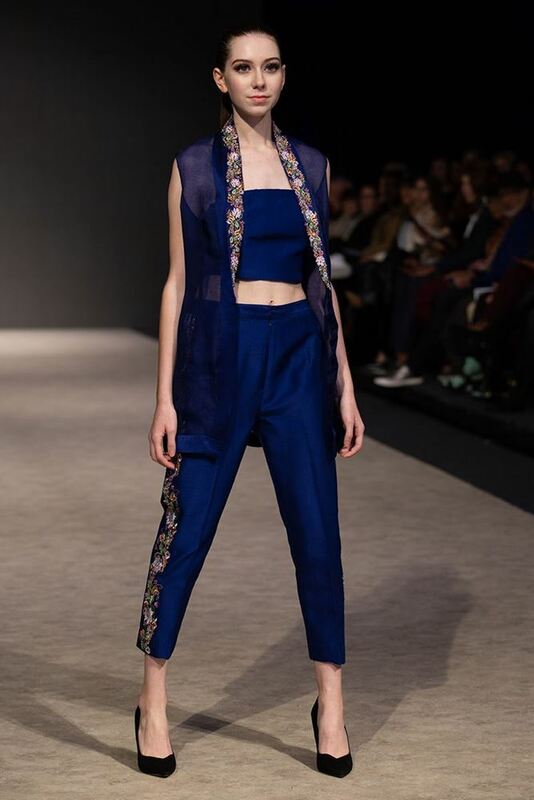 She kept the embroidery to a minimum so it complements the aqueous hues perfectly. 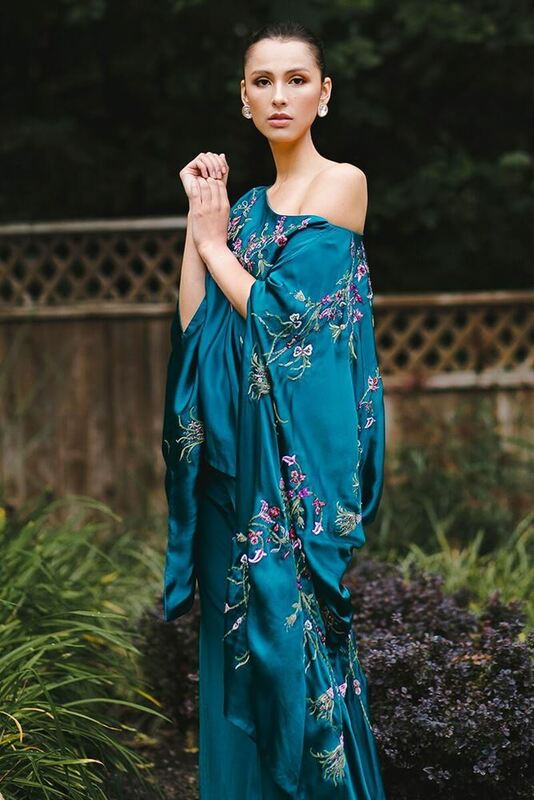 The dresses in teal feature the silhouettes of a versatile poncho, an off shoulder tunic with elongated sleeves, the short shirt, and an overcoat shaped shirt. It’s all very modern, yet with a subtle effect. You can pair them with bootleg pants or straight trousers. 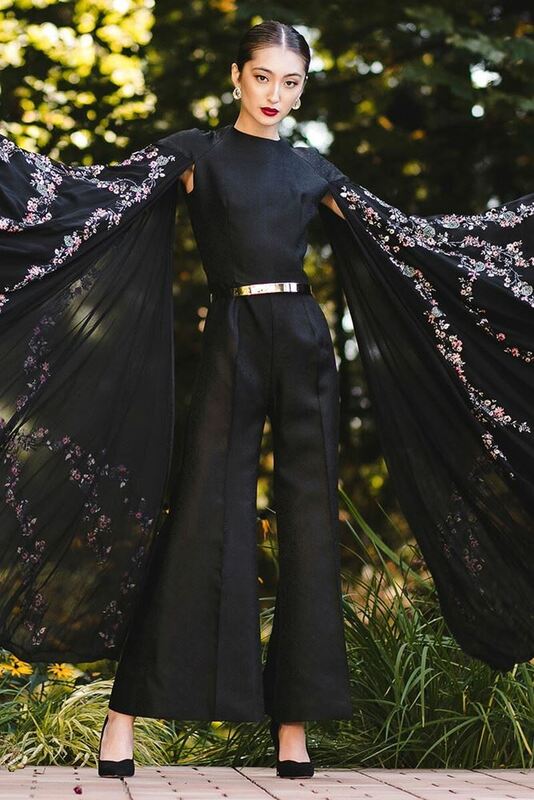 The color black may be basic but the bejeweled pantsuits are anything but. Put out a power vibe with the black pantsuits with exquisite detailing. Regal, jeweled gowns in this collection are really something to look at. All four of the outfits are encrusted with the handcrafted, gold and silver embroidery. 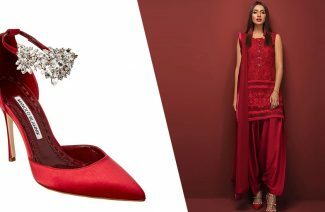 These outfits are perfect for evening engagements, when you need to dress to slay. The cobalt blue range in Shanaz features two knee length pieces, a floor length maxi and a pantsuit. All articles are beautiful in their elegant sophistication and we cannot get enough of. Cobalt blue is a real powerful color, and it takes a powerful woman to carry it to perfection. The color matched with easy going silhouettes will give you the confidence you might need to dazzle at any function. The designer was right to be excited by her spring summer ’19 fusion articles. Her collection comes out as fresh with its metallic lustrous colors and glittering embellishments. Here’s what she had to say about her work: “This collection is very close to my heart as it is a tribute to my late-mother, Shanaz. Shanaz symbolizes love, compassion, integrity, courage and endurance. My mother was my support, my mentor, my best friend”. 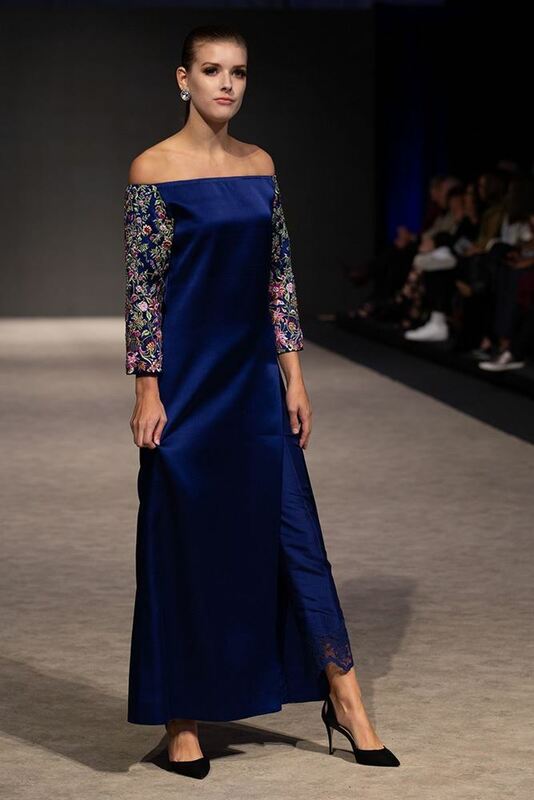 The renowned couture designer of Pakistan, Shamsha Hashwani showcased her latest collection of fusion couture at Vancouver Fashion Week Spring/Summer’19.